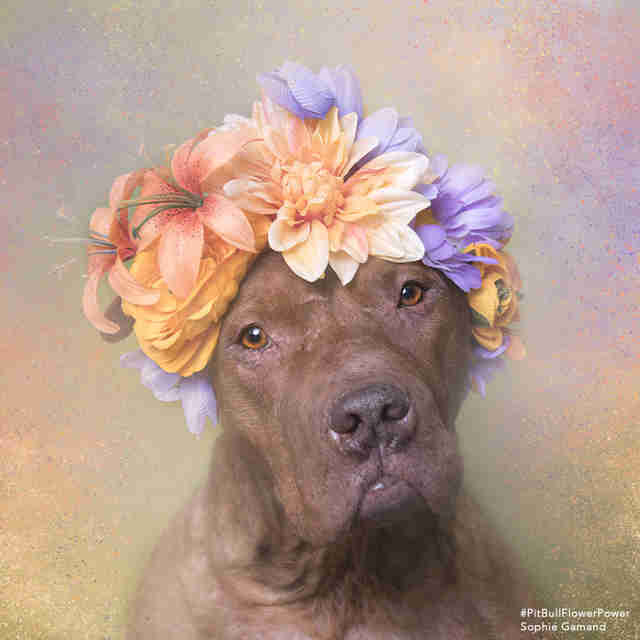 Photographer Sophie Gamand used to be "a little apprehensive" around pit bulls, but now that she's spent 5 years photographing adoptable pitties, she knows the truth. "I always tell people: if you really want to make up your own opinion about them, don't just sit at home and read articles: Go to your local shelter and volunteer, be in contact with these dogs regularly, discover for yourself!" she told The Dodo. 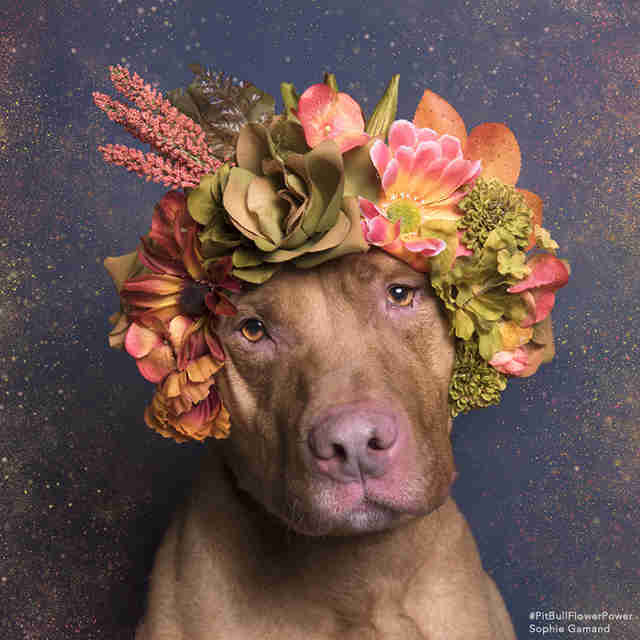 Gamand, a native of France living in New York City, has been visiting pit bulls in shelters, dressing them in delicate flower crowns to highlight their sweet sides - in hopes of convincing potential adopters to help save their lives. 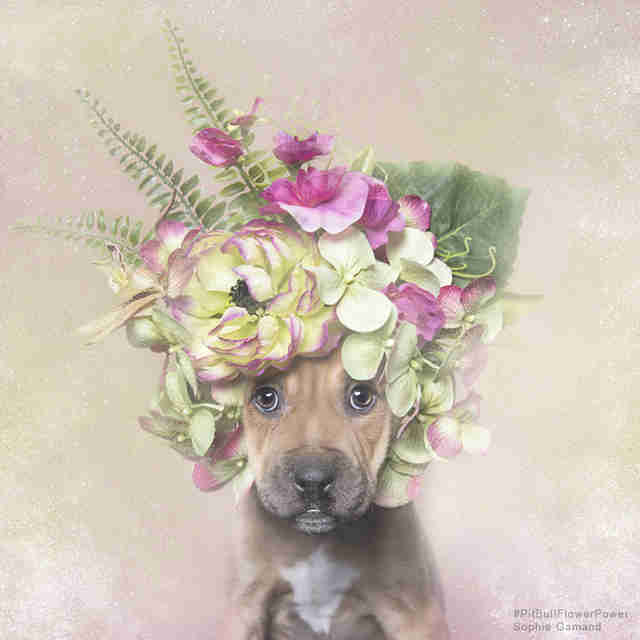 The result is the Pit Bull Flower Power project, and a new batch of gorgeous portraits is out just in time for spring. "America euthanizes upward of 1 million pit bulls every year," Gamand said. "This is a quiet massacre that is happening every day in our country. Isn't it about time we address it?" 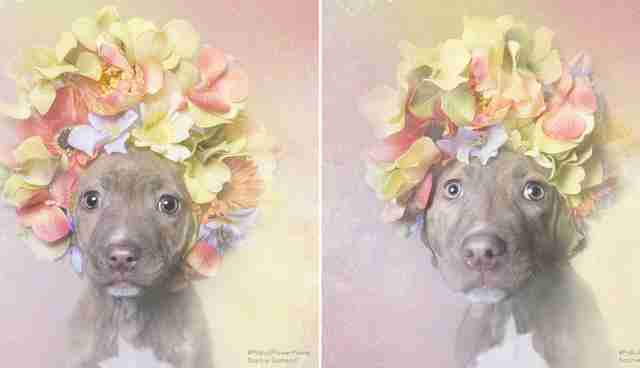 So far, Gamand has helped dozens of pit bulls find homes with her glamorous portraits. She told The Dodo about a few of her favorite models. Here's Akoni, whom Gamand photographed twice, once as a puppy and again when she was bigger - and in search of a home once again. "She had been adopted and returned by her adopter. Now she is finally in a forever home!" "Brownie sat at the shelter for 2 years, overlooked. When this portrait of her came out, it only took a few days for John to see her and fall in love. He adopted her and told me 'it was love at first sight.'" "Casper is available for adoption at Sean Casey Animal Rescue [in Brooklyn, New York]. He is a big, good boy. 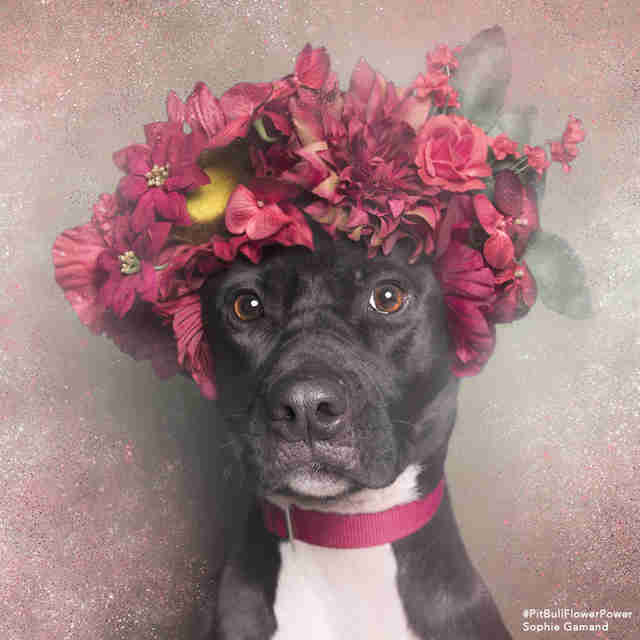 When the shelter shared this photo, they did not expect the response they received: the photos were shared about 80,000 times on Facebook, and viewed 9 million times!!!" Shirley is currently up for adoption at Sean Casey Animal Rescue. "Unfortunately, she is shy so she does not show well to potential adopters who always end up going for an easier dog," Gamand said. "Yet, she is very loving once she knows you! Shirley is so worried now that her cage is the only place she wants to be. It has become difficult for her to leave her cage. How sad. She also has the cutest curly tail you'll see." Kona has been through a lot, and he's still waiting for a family at Mr. Bones and Co in New York City: "He loses his balance, his head shakes sometimes. He probably does not have lot of time left with us, but he is the most lovable boy I have ever met! When I came in to take the photo, he just walked towards me and covered me in kisses. Such a beautiful boy who has had a very tough life. I wish a family would take him and give him the best time of this life!" 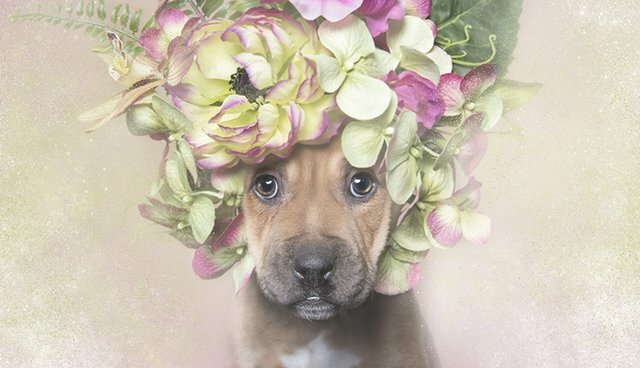 Kahula's flower crown was just a tad too big for her little head: "I mean, what can I say? I love that face and I love that crown on her. I only had adult size crowns that day." This adorable photo helped her find her forever family. See more of Gamand's portraits on her website, or follow her on Instagram. There will be plenty of updates as she expands the project. 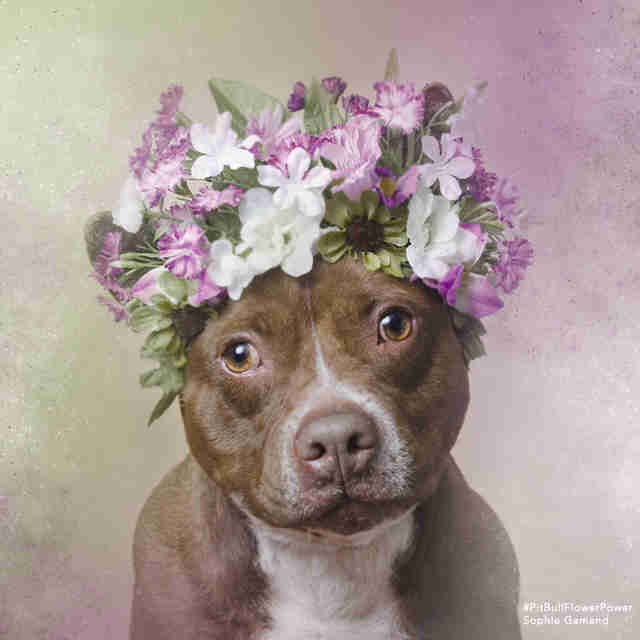 To find adoptable pit bulls near you, search on Petfinder or visit your local Humane Society.